Gold is one of those investments that many people wish they owned when looking back at its price movements in history. During periods of uncertainty, wars, economic crashes and high inflation, gold really shines. But when were some of the best times to own gold? How did those opportunities come about? What did gold investors gain? These are just some of the questions that we’ve answered for you below. Ancient Rome was an innovator in the debasement of money and a pioneer in proving the effects of inflation. Augustus established a gold standard in 30 BC, but that lasted only about 100 years. Nero reduced the weight of the denarius by 4% and the silver content by about 5%. Two-hundred years later, the denarius only contained 40% silver. This idea continued in the future as Rome continued to decrease the gold and silver content in its money. Emperor Diocletian attempted to fix the value of one pound of gold at 50,000 denarii in 301 AD, but by 324 AD, the exchange rate was 300,000 to one pound and the rate jumped to 2.1 billion per pound by the mid-4th century. Nixon would end the US Dollar’s tie to the gold standard in 1971, forever changing our economy and turning our currency into a true fiat currency that wasn’t backed by anything but the word of the United States Government. Just prior to the start of 1971, gold was trading at only $36 per ounce. Four years later, gold would reach $183 per ounce. That’s a gain of over 400% in four short years. As gold was de-pegged from the US Dollar, its value continued to gain. It would go on to take a breather for a few short years before roaring higher again in 1976. As the United States moved into the later 1970s, prices started to soar due to inflation, the coming oil crisis and high interest rate environment that marked the period. In 1976, the price of gold had declined to a new bottom of $110 per ounce, but by 1980, gold would reach $660 per ounce. That’s a gain of over 500% over four years. This is a classic example of how economic uncertainty, crushing interest rates and consumer fears can drive the price of gold into the stratosphere. By 1999, investors had all but forgotten about gold and the great runs it had in decades prior. The economy was booming with all the new technology companies, the growth of the internet and the explosion of economic growth that marked this economic period in U.S. history. In 2001, the price of gold had bottomed out at $265 per ounce, but, by 2011, gold would reach $1,770 per ounce. That’s a gain of over 560% over this long 10 year run. By 2007, investors had all but forgotten about gold and the great runs it had in the decades prior. The economy was booming from all the new technology companies, stock market was making new record highs, the growth of the internet and the explosion of economic growth that marked this economic period in US history. Then the stock bubble burst, Great Recession hit and some of the biggest banks in the US went under. 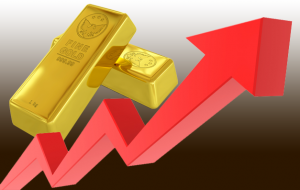 In 2008, the price of gold fluctuated around $800 per ounce, but by 2011, gold would reach highs near $1,900 per ounce. That’s a gain of over 138% over this short 3 year run. History proves that although gold has its downs, it always recovers. When gold recovers, you reap all the benefits, and this is why physical gold must be considered as a long-term investment. Call American Bullion now and be the smart investor who reaps the rewards of gold investing.